Building upon the success of last year's Skylanders Cloud Patrol, Activision is preparing to unleash the full force of its toys-meets-video-games franchise on mobile devices, with two new titles due out next month, a mobile-friendly Portal of Power and a rejuvenation of Cloud Patrol courtesy of the Activate community service. We've already seen the first of these two new Skylanders games; in fact the more Canadian among us have already been playing it. Skylanders: Lost Islands is a city-builder with an adventurous side. Players can import their figures into the game through codes included with the toy or through the new Bluetooth Portal of Power. Once in-game the Skylanders can be sent on missions, gathering resources to buy more buildings, decorations and islands, thus unlocking even more adventure. It's a little bit DragonVale, really, only instead of breeding creatures you're buying them. Players looking for a more action-packed experience might like Skylanders Battlegrounds. In this game the indomitable Flynn recruits the player's Skylanders to defeat an army being gathered by a mysterious Chaos Warlord. 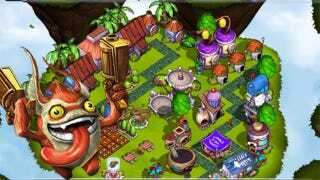 Players explore a hex-based map, engaging with enemy forces in battle arenas based on the series' eight elements. In combat Skylanders are guided about the screen by the player's finger, auto-attacking when in range of the enemy. Elemental strengths and weaknesses come into play here, so there's a certain element of strategy to the proceedings. Skylanders Battlegrounds is an incredibly attractive iOS game, utilizing the Xbox 360 version of Skylanders Giants' assets to build its hex-based world. I'd love to show it to you, but Activision has nothing to share asset-wise at the moment. The two new iOS Skylanders games are due out next month, along with a $49.99 iOS starter pack that includes three figures, the new Bluetooth portal and a code to download the games for free. As for Skylanders Cloud Patrol, expect new challenges and an exciting community element coming to that title soon, courtesy of Activision's new Activiate mobile platform. It's a supplemental service that players can login to using their Facebook credentials, enhancing the user experience in Activision's mobile titles without too much fuss. In Skylanders Cloud Patrol these new features take the form of a challenge system. The game will regularly issue missions to players — scoring the most combos in ten minutes, for instance. Players will compete against their Activate friends, and the more friends they beat the bigger the in-game rewards. It's an interesting method of extending the online features of Activision's mobile games. Imagine what it could do for a Call of Duty title. For now it's all about Skylanders, giving fans even more ways to play with those colorful pieces of plastic they spent so much cash on.